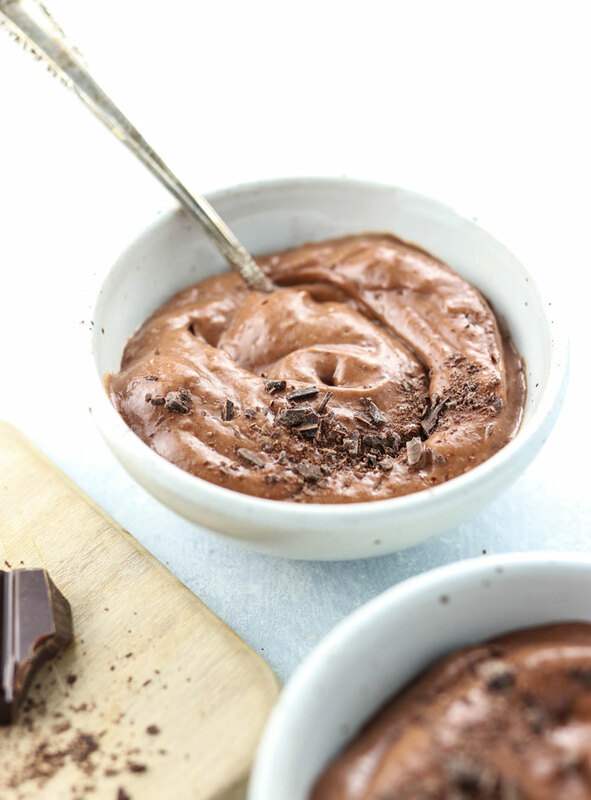 This Cherry Chocolate Avocado Pudding is a creamy and healthy dessert. 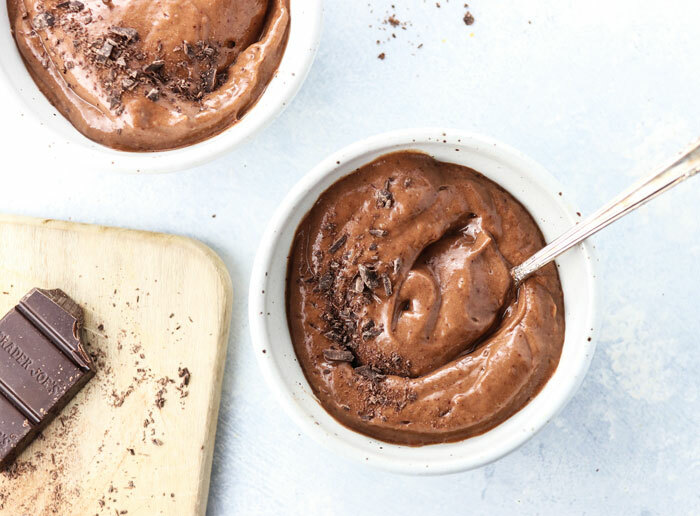 It calls for just a handful of all-natural ingredients and can be whipped up in no time! Cherries and chocolate make a delicious pair, and I love how the tart cherries totally mask the avocado flavor. The avocado adds creaminess, but otherwise goes unnoticed in this cold and creamy pudding. I hope you’ll enjoy it as a naturally-sweetened dessert! 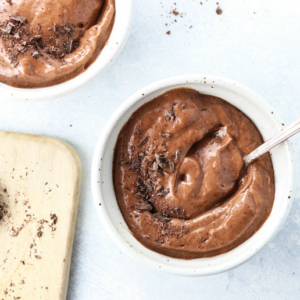 A sweet and tart, decadently chocolate pudding. You can't taste the avocado at all! Serve immediately, or store in the fridge for later. *You can replace the dates with 1 to 2 tablespoons of pure maple syrup, or with stevia to taste. I’ve successfully used raw cacao and cocoa powder in this recipe, so either one should work fine. 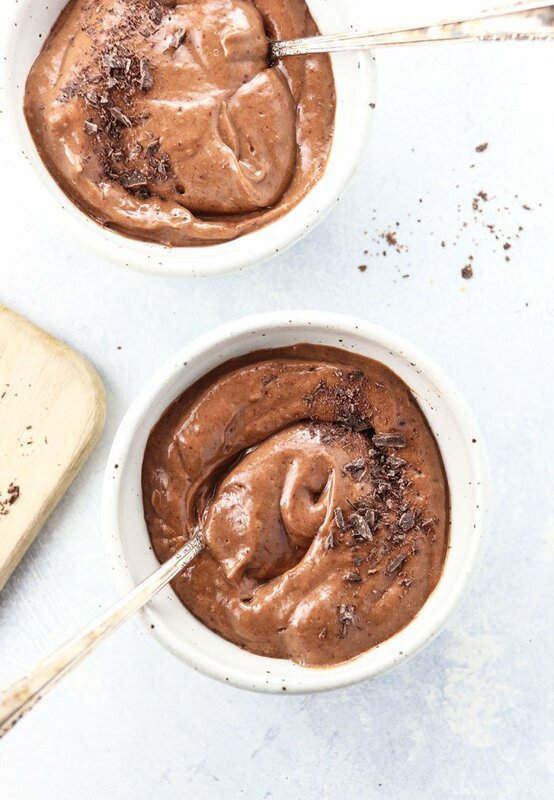 If you don’t want to use cocoa, you could use carob powder as a substitute, keeping in mind that it will change the flavor. This recipe is only nut-free if you omit the almond extract, but I highly recommend that you try it if you can tolerate almonds. It really brings out the cherry flavor! YUM!!!!!!! Your pudding sounds absolutely AMAZING!!!! Wow that was amazing pudding! I couldn’t help myself though, I used agave after going back and forth between that and organic maple syrup. My husband will go for the stevia I’m sure. As for the headaches I’ve heard rubbing a good pure Peppermint essential oil like Young Living on your temples and back of neck may help. I also have my family inhale it from the bottle when they are nauseated or headachey. Hi! The recipe for the cherry chocolate pudding sounds great! Can’t wait to try it. Before you get another headache, see if you can find a good aromatherapist. Mine mixed up an all natural headache oil for me and I rub some on my hands and just breathe it in. I’m sure the deep breaths don’t hurt either. If you can’t find someone, I’m sure Lisa would be happy to mail some to you. lissettemassage.com She also made me a wake up oil that I sniff in the morning if I’m really having trouble waking up. I’ve been using it more since I quit coffee, which I know you are trying to do! Frozen fruit is truly one of the secrets to a great smoothie. I used mango today- mmm. My condolences to your husband for his loss. But wearing a taffeta dress should cheer him right up! I’m pretty sure I just fell in love. With the pudding. I’ve been loving the smoothie version, but pudding always wins. I’m totally getting a vita mix thanks a lot to you. I’m actually not a smoothie girl but I love me some pudding! headaches? well in yoga we learned about certain poses that relieve the blood flow to you head like shoulder stand. Also, I find that having a green apple always works, and yes, it has to be a green one. Something about the skin is supposed to help relive the pain. Sometimes, I think we are just tired and all we need is a good nap. have a great weeekend hon! I get dehydration headaches pretty often. I usually drink a little coconut water or gatorade followed by tons of water and it helps. If that doesn’t work, I try stretching. Sounds weird but it usually works for me to release some tension and stretching is perfect for that! Ever since I saw a recipe for raw chocolate mousse pie made with avocado I’ve been meaning to make an avocado dessert. That looks amazing! Usually when I have a headache it means I’ve either been staring at my computer screen for too long or haven’t had enough caffeine. I don’t even drink that much caffeine, but if I don’t have my one cup in the morning I’ll usually get one! If it’s caused by the computer it’s easy enough to cure as long as I’m not at work. It’s impossible to get away from it at the office. It is most def dehydration! You know me, I am a water freak and yes this causes headaches! thats my one beef with larabars! they are so small. 4 bites and you are done! My workout buddy is a bride to be…nothing like “Want to look great in my dress” motivation to keep a gal active huh?? You are so creative with all your raw recipes! Love it. What an awesome work out buddy you have! And I totally agree. Larabars are getting SO. MUCH. SMALLER. It’s so disappointing! I just tried the choc-cado blueberry chip pudding for the first time tonight and I HEART IT!! 🙂 Definetly going to need to try the cherry chocolate bomb next!! mmm aroma! i really loved the chopped salad i had there the other night. 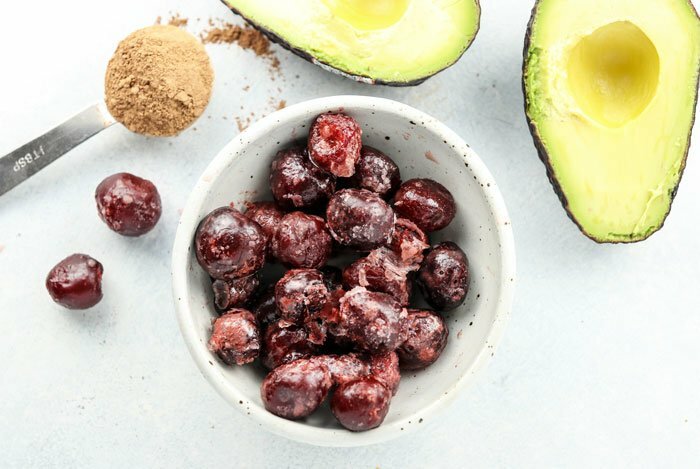 I love that pic of the frozen cherries — that is one of my favorite snacks and I love using them in smoothies. For headaches I usually need a little nap, or it is lack of water or caffeine. But usually for me it is lack of sleep or proper rest and that is the only thing that will help my head!